LSU Law 2018 graduates Jessica Finley and Sara Kuebel and current 3L student Jacob Cunningham tied for third place for the prestigious 2019 Scribes Brief-Writing Award. Scribes, the American Society of Legal Writers, has presented an annual award for the best student-written brief since 1996. The competition reviews the winners of every “best brief” award from the dozens of regional and national moot court competitions held across the US each year, and a panel of attorneys, faculty, and sitting judges select the winning briefs from this pool. Cunningham, Finley, and Kuebel were members of the team that won the 2018 John R. Brown National Admiralty Law Moot Court Competition as well as the competition’s Maritime Law Association of the United States Award for the Best Brief. 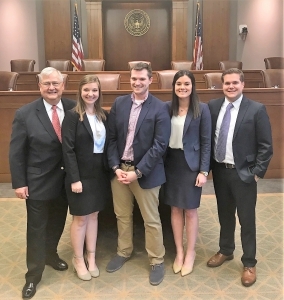 The team will be recognized April 12 during a Scribes CLE and Award Ceremony at the Law Library of Congress in Washington, D.C.
Students from Florida State University College of Law won first place. South Texas College of Law came in second. LSU Law tied for third place with the University of California, Hastings College of the Law.